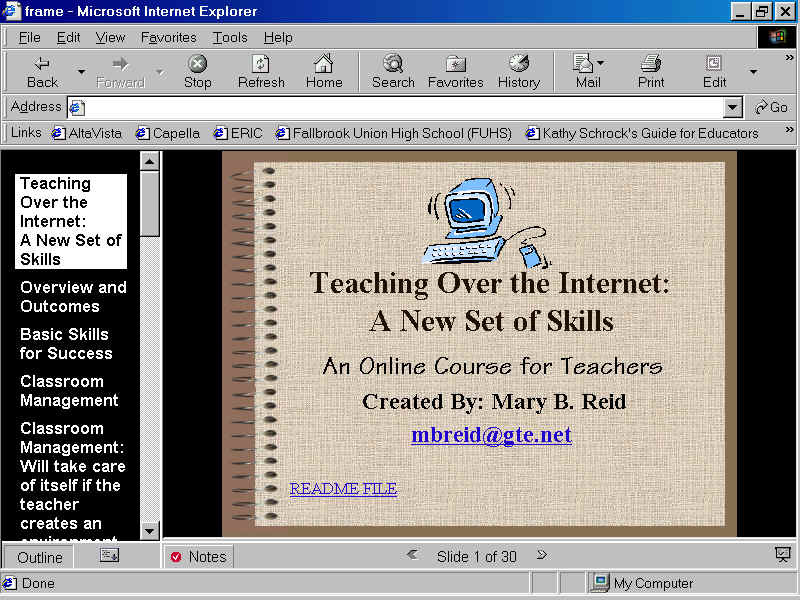 This course was created using PowerPoint 2000 and was saved as a web page. It is best viewed using Internet Explorer 5.0 with a screen resolution of at least 800x600. If you experience difficulty viewing these pages, you may be required to download a plug-in to view certain java-scripting. This plug-in will only enhance your viewing capabilities and is not required to access the site. Your screen should look like the image below. It is currently in frame view. On the left, you have links to all of the slides in the course. Clicking on the title of the slide takes you to that slide in the middle of the screen. You have the option of collapsing or expanding the outline by clicking on the buttons below the menu. You can also navigate through the course by clicking on the back and forward arrows at the bottom of your screen to move through the course slides. If you wish to view the course as an actual PowerPoint Slide Show, click on the button at the bottom far right. This is a full screen slide show and you move forward by clicking on the screen with your mouse. You may stop the slide show by hitting your escape key at any time during the show. Since this is a full-screen show, when you click on hyperlinks they will be viewed full-screen as well, and at this point, there doesn't seem to be a way back to the slide show. Oops. I do not recommend viewing this course as a full screen slide show. Please make sure you click on the button at the bottom that says Notes. Here, I have given you additional information and content that you will need to complete this course. By selecting "Notes", you are able to read the information that I have included with each slide. Since this course is intended to accompany a workshop presentation, you are able to follow what I would be saying while showing each slide. Make sure you click on the Notes button to view all of the information for this course.